A TOTAL of 12 town homes are planned on the three lots, which have been occupied by a dilapidated house and run-down autos. After more than a decade of neighbors’ complaints, cleanup is underway at the unsightly house at 610 S. Van Ness Ave. Surrounded by palm-frond fences, the derelict structure adjoins two lots previously filled with a collection of rusty old cars. In mid-July, demolition of the house finally was underway. 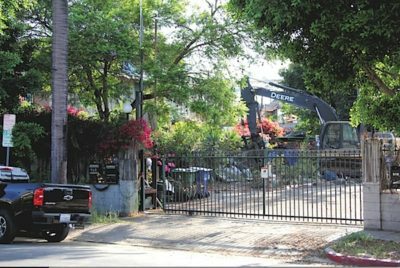 When the three lots have been cleaned up, they will become a construction site for 12 new town homes being built by developer Michael Winter, with designs by Venice-based architecture studio Electric Bowery, all pursuant to the Park Mile Specific Plan. The Park Mile zoning in this block of Van Ness, south of Sixth St., is for low-density, multiple-family (RD-3) residences on both sides of the street. A town house condominium building across the street was built in 1980, following adoption of the Specific Plan. 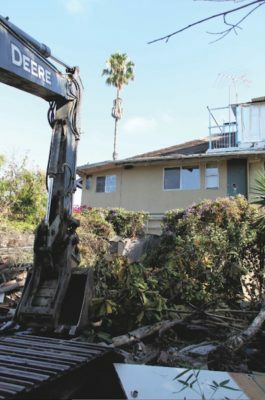 DEMOLITION followed years of neighbor complaints. In Dec. 2016, the Park Mile Design Review Board (PMDRB) and city staff concurred that Winter’s project complies with the terms of the Specific Plan, although three units were added and six guest parking spaces were eliminated pursuant to a state law (SB 1818) that overrides Los Angeles zoning to promote construction of additional affordable housing units. The architects’ plans for the town homes feature units with three-bedrooms plus den and four baths; 11 of the units will have attached two-car garages (with the single “affordable” unit having two adjacent surface spaces). Sales prices have not yet been established; completion of construction is unlikely before the end of 2018. At the several PMDRB meetings held in 2016, the next-door neighbor, Maria Sountas-Argiropoulos, objected to the project. After it was approved by the director of planning, she appealed his decision to the Central Area Planning Commission, and that appeal was denied on May 24. Subsequently, in early June, she filed a further appeal, this time primarily of the project’s environmental determination, with the Los Angeles City Council. No Council hearing date had been set as of press time.